董赛红, 任国栋. 中国云南烁甲属分类研究及中国三新纪录种(鞘翅目:拟步甲科:烁甲族)[J]. 四川动物, 2017, 36(6): 697-701. DONG Saihong, REN Guodong. Taxonomy of the Genus Amarygmus Dalman, 1823 from Yunnan, China and Three New Record Species from China (Coleoptera:Tenebrionidae:Amarygmini)[J]. Sichuan Journal of Zoology, 2017, 36(6): 697-701. *通信作者 Corresponding author, 任国栋, E-mail:gdren@hbu.edu.cn. Abstract: The genus Amarygmus Dalman, 1823 from Yunnan, China was studied in this paper. Three new record species from China, A. tonkineus Pic, 1922, A. filicornis (Gravely, 1915), and A. nodicornis (Gravely, 1915), and two new record species from Yunnan province, A. adonis (Pic, 1922) and A. sinensis Pic, 1922 were reported. The keys to species in Yunnan and geographical distribution were provided. Specimens are deposited in the Hebei University Museum. Amarygmus Dalman，1823：1823，60 (Type species：Chrysomela micans Fabricius，1794). Gebien 1920，409-410；Bremer 2005b，201. Dietysus Pascoe，1866：1866，486 (Type species：Dietysus confusus Pascoe，1866). Synonymised by Gebien 1920，410. Elixota Pascoe，1866：1866，475 (Type species：Elixota cuprea Pascoe，1866). Synonymised by Bremer 2001a，65. Eurypera Pascoe，1870：1870，106 (Type species：Eurypera cuprea Pascoe，1870). Synonymised by Blackburn, 1893, 53. Aphyllocerus Fairmaire，1881：1881a，248；1881b，349 (Type species：Aphyllocerus decipiens Fairmaire，1881). Synonymised by Gebien 1920，410. Anacycus Fairmaire，1896：1896，33 (Type species：Anacycus navicularis Fairmaire，1896). Synonymised to Elixota Pascoe，1866 by Blair：1929 ，245. Platolenes Gebien，1913：1913a，420-421 (Type species：Platolenes rufipes Gebien，1913). Synonymi-sed by Bremer 2001a，69. Pseudamarygmus Pic，1915：1915b，9 (Type species：Pseudamarygmus testaceipes Pic，1915). Synonymised by Bremer 2001a，67. Apelina Saha，1988：1988，429-430 (Type species：Apelina keralaensis Saha，1988). Synonymised by Bremer 2014，3. Plesiamarygmus Masumoto，1989：1989，314 (Type species：Dietysus ovoideus Fairmaire，1882). Synonymised by Bremer 2005b，205. Pyanirygmus Pic，1915：1915b，9 (Type species：Pyanirygmus corinthius Pic，1915). Synonymised by Bremer 2005b，206-208. Hyperamarygmus Kaszab，1964：291-292 (Type species：Hyperamarygmus antennalis Kaszab，1964). Synonymised by Bremer 2001a，70. Oogeton Miwa，1939：412 (Type species：Oogeton makii Miwa，1939). Synonymised by Bremer 2005b，209. Becvaramarygmus Masumoto，1999：369 (Type species：Dietysus nodicornis Gravely，1915). Synonymised by Bremer 2005b，209. Podamarygmus Carter，1928：287 (Type species：Podamarygmus alternans Carter，1928). Synonymised by Bremer 2006，37. Dryadigmus Bremer，2007：26 (Type species：Dryadigmus cechovskyi Bremer，2007). Synonymised by Bremer 2007，26. Varogeton Bremer，2014：37 (Type species：Dietysus subannulipes Pic，1922). Synonymised by Bremer 2014，37. Amarygmus formosanus Pic，1915：1915a，21. Synonymized by Ardoin，1969：126. Amarygmus longipillis Pic，1922：1922b，303. Synonymized by Bremer，2001b：84. Amarygmus pilipes (Gebien，1913)：Bremer，2001a：57；Bremer，2005a：20；I.Löbl & A. Smetana，2008：216. Amarygmus punctatus (Pic，1922)：Bremer，2001a：57；Bremer，2003：72；I.Löbl & A. Smetana，2008：216. Amarygmus sinensis Pic，1922：1922a：11；Bremer，2004：33；I.Löbl & A. Smetana，2008：216. Amarygmuss peciosus Dalman，1823：61；Bremer，2003：81；I.Löbl & A. Smetana，2008：216. Dietysus filicornis Gravely，1915：532-553；ppl. XLIV，Fig. 14. Amarygmus atricolor (Pic，1922)：Gebien 1944：502；[syn. ]：Bremer 2005b：217. Dietysus nodicornis Gravely，1915：533-534，pl. XLIV，Fig. 15. Amarygmus vitalisi (Pic，1922)：Gebien 1944：505；[syn. ]：Bremer 2005b：214. Amarygmus (Becvaramarygmus) nodicornis (Gravely，1915)；[stat. n.]：Bremer 2005b：214. 图版Ⅰ 烁甲属中国三新纪录种 PlateⅠ Three new record species of the genus Amarygmus Dalman, 1823 from China 1.越北烁甲Amarygmus tonkineus Pic，1922；2.丝角烁甲Amarygmus filicornis (Gravely，1915)；3.肿腿烁甲Amarygmus nodicornis (Gravely，1915) ♂；4.肿腿烁甲Amarygmus nodicornis (Gravely，1915) ♀；5~7.肿腿烁甲Amarygmus nodicornis (Gravely，1915)，5.前足背面观foreleg in dorsal view，6.前足腹面观foreleg in ventral view，7.触角antenna. Ardoin P. 1969. Note synonymique (Col. Tenebrionidae)[J]. Bulletin de la Société entomologique de France, 74: 124–127. Blair K G. 1929. Some new species of Myrmicophilous Tenebrionidae (Col.)[J]. Zoologischer Anzeiger: 238–247. Bremer HJ. 2001a. Revision der Gattung Amarygmus Dalman, 1823 und verwandter Gattungen. Ⅰ. Allgemeine Bemerkungen; Status einiger Gattungen affine Amarygmus Dalman; neue Kombinationen von Arten der Gattung Amarygmus (Coleoptera:Tenebrionidae:Alleculinae:Amagygmini)[J]. Coleoptera, 5: 57–80. Bremer HJ. 2001b. Revision der Gattung Amarygmus Dalman, 1823 und verwandter Gattungen. Ⅱ. Neue Gattungen affine Amarygmus mit neuen Arten, sowie neue Arten und Synonyme[J]. Coleoptera, 5: 81–106. Bremer HJ. 2003. Revision derGattung Amarygmus Dalman, 1823 sowie verwandter Gattungen. ⅩⅥ. Erste Mitteilung über lang gestreckte Arten aus der orientalischen Region:Nachbeschreibungen und Abbildungen beschriebener Arten sowie Neubeschreibungen (Coleoptera:Tenebrionidae; Amarygmini)[J]. Annales Historico-Naturales Musei Nationalis Hungarici, 95: 37–105. Bremer HJ. 2004. Revision der Gattung Amarygmus Dalman, 1823 sowie verwandter Gattungen. ⅩⅪ. Nachbeschreibungen, Neubeschreibungen und Illustrationen von Amarygmus-Arten der orientalischen Region (Coleoptera; Tenebrionidae; Amarygmini)[J]. Acta Coleopterologica, 20(1): 7–86. Bremer HJ. 2005a. Revision der Gattung Amarygmus Dalman, 1823 sowie verwandter Gattungen. ⅩⅩⅩⅢ. Die Amarygmus-Arten der orientalischen Region mit Makeln auf Flügeldecken. 2. Mitteilung (Coleoptera; Tenebrionidae; Amarygmini)[J]. Acta Coleopterologica, 21(2): 9–50. Bremer HJ. 2005b. Revision der Gattung Amarygmus Dalman, 1823 sowie verwandter Gattungen. ⅩⅩⅩⅣ. Anmerkungen zu den Genera Amarygmus Dalman, Becvaramarygmus Masumoto, Eumolpamarygmus Pic, Lobatopezus Pic, Oogeton Kaszab und Pyanirygmus Pic (Insecta, Coleoptera, Tenebrionidae, Amarygmini, Chrysomelidae, Eumolpinae)[J]. Spixiana, 28(3): 199–221. Bremer HJ. 2006. Revision der Gattung Amarygmus Dalman, 1823 und verwandter Gattungen. XLI. Die Amarygmus-Arten des Subgenus Podamarygmus Carter (Col.:Tenebrionidae:Amarygmini)[J]. Acta Coleopterologica, 22(1): 35–60. Bremer HJ. 2007. Revision der Gattung Amarygmus Dalman, 1823 sowie verwandter Gattungen (Coleoptera:Tenebrionidae:Amarygmini)[J]. Stuttgarter Beiträge zur Naturkunde, Serie A (Biologie), Nr, 707: 1–48. Bremer HJ. 2011. Revision of the genus Amarygmus Dalman and related genera. LIX. New elongate Amarygmus from Thailand, Laos, Vietnam and southern China (Coleoptera:Tenebrionidae:Amarygmini)[J]. Acta Coleopterologica, 27(2): 3–30. Bremer HJ. 2014. Revision of Amarygmus Dalman, 1823 and related genera. part LXXⅡ. The Amarygmini of Borneo (Coleoptera:Tenebrionidae), part Ⅳ. Species of the genus Plesiophthalmus and related genera (including species of Sumatra, Java and partially Peninsular Malaysia)[J]. Mitteilungen der Münchner Entomologischen Gesellschaft, 104: 31–83. Bremer HJ, Lillig M. 2014. World Catalogue of Amarygmini, Rhysopaussini and Falsocossyphini (Coleoptera; Tenebrionidae)[J]. Mitteilungen der Münchner Entomologischen Gesellschaft, 104(Suppl. ): 3–176. Carter HJ. 1928. Revision of the Australian species of the genera Curis, Neocuris and Trachys, together with notes and descriptions of new species of other Coleoptera[J]. Proceedings of the Linnean Society of New South Wales, 53: 270–290. Dalman JW. 1823. Analecta entomologica[M]. Holmiae: Typis Lindhianis: 104. Fairmaire L. 1881a. Essai sur les coléoptères des îles Viti (Fidgi)[J]. Annales de la Société entomologique de France, 1: 243–318. Fairmaire L. 1881b. Diagnoses de coléoptères de la Mélanésie[J]. Le Naturaliste, 1: 348–349. Fairmaire L. 1896. Hétéromères des l'Inde recueilles par M. Andrewes[J]. Annales de la Société entomologique de Belgique, 40: 6–60. Gebien H. 1913a. Die Tenebrioniden der Philippinen[J]. The Philippine Journal of Science, Section D, 8: 373–433. Gebien H. 1913b. H. Sauter's Formosa-Ausbeute. Tenebrionidae (Coleopt.)[J]. Archiv für Naturgeschichte, 79A: 1–58. Gebien H. 1920. Coleoptera, Tenebrionidae[M]//Nova Guinea, Résultats de l'expédition scientifique néerlandaise à la Nouvelle-Guinée en 1912 & 1913 sous les auspices de A. Franssen Herderschee. Vol. ⅩⅢ (3); Zoologie. Leiden:E. J. Brill:213-500. Gebien H. 1944. Katalog der Tenebrioniden[J]. Mitteilungen der Münchner Entomologischen Gesellschaft, 34: 497–555. Gravely FH. 1915. Coleoptera, Ⅸ:Tenebrionidae[M]//Zoological results of the Abor Expedition, 1911-12. XLⅡ. Coleoptera Ⅸ:Tenebrionidae. Records of the Indian Museum 8[1912-1922]:519-536. Kaszab Z. 1964. Tenebrioniden (Coleoptera) der Insel Amboina, gesammelt von A M. R. Wegner[J]. Tijdschrift voor Entomologie, 107: 283–296. Kaszab Z. 1980. Angaben zur Kenntnis der Tenebrioniden Nordvietnams (Coleoptera)[J]. Annales Historico-Naturales Musei Nationalis Hungarici, 72: 169–221. Masumoto K. 1989. Plesiophthalmus and its allied genera (Coleoptera, Tenebrionidae, Amarygmini) (Part 4)[J]. The Japanese Journal of Entomology, 57: 295–317. Masumoto K. 1999. Additions to Plesiophthalmus and its allied genera (Coleoptera, Tenebrionidae, Amarygmini) from East Asia, Part 1[J]. Elytra (Tokyo), 27(2): 353–370. Miwa Y. 1939. 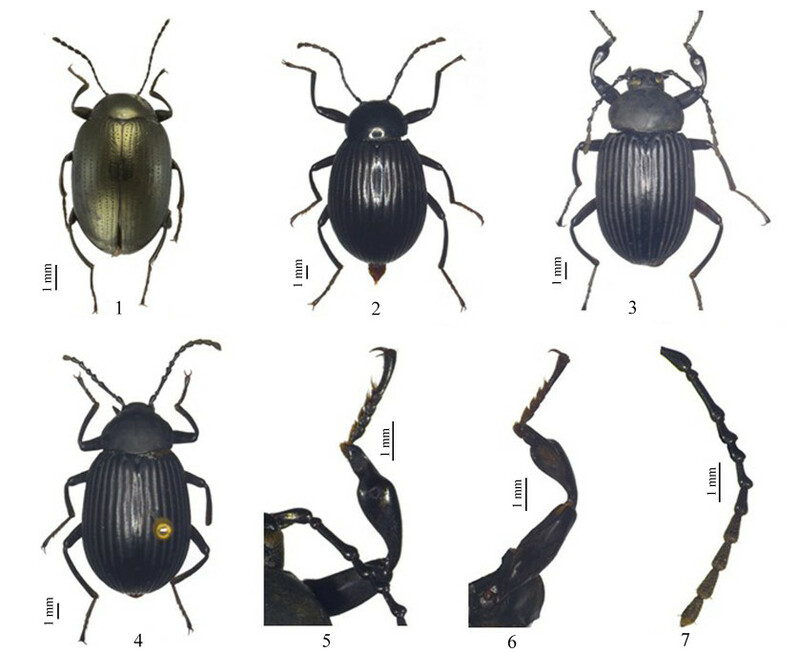 Description on four new species belonging to the Family Tenebrionidae from Formosa[J]. Zoological Magazine (Tokyo), 5(7): 412–415. Pascoe FP. 1866. Notices of new or little-known genera and species of Coleoptera[J]. Journal of Entomology, 2: 443–493. Pascoe FP. 1870. Additions to the Tenebrionidae of Australia[J]. The Annals and Magazine of Natural History including Zoology, Botany, and Geology, 5: 94–107. Pic M. 1915a. Diagnoses d'Hétéromères[J]. Mélanges Exotico-entomologiques, 16: 14–24. Pic M. 1915b. Genre nouveaux, espèces & variétés nouvelles[J]. Mélanges Exotico-entomologiques, 16: 2–13. Pic M. 1922a. Nouveautés diverses[J]. Mélanges Exotico-entomologiques, 36: 1–32. Pic M. 1922b. Sur les Hétéromères Amarygminae[Col.][J]. Bulletin de la Société zoologique de France, 47: 303–306. Pic M. 1924. Nouveautés diverses[J]. Mélanges exotico-entomologiques, 41: 1–32. Saha GN. 1988. A new genus of Amarygmini (Coleoptera:Tenebrionidae) from India[J]. Records of the Zoological Survey of India, 85(3): 429–432.